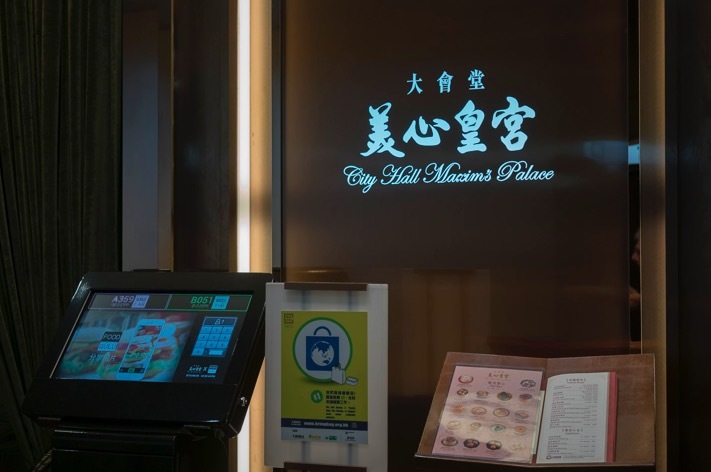 There is probably NO guide book that does NOT mention the famous Maxim’s Palace in Hong Kong’s City Hall… but it took me more than four years to give this famous place a go. And the only reason we went is that we were next door at the City Gallery and when we finished walking through the exhibition, we were hungry and wanted to grab a bite. 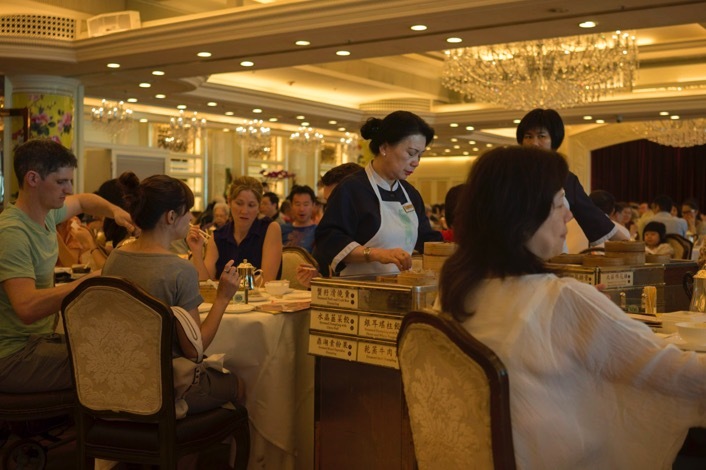 It was perfect timing, just around 2.30pm, so we could still squeeze into the famous restaurant and enjoy some Dim Sum. There are two things that make this restaurant special – one is the setting: yes, it is a huge room, but it is beautifully decorated – with thick white tablecloth, flowers on the table and chandeliers on the ceiling. Not that you can eat those decorations but they add a nice touch to the room. 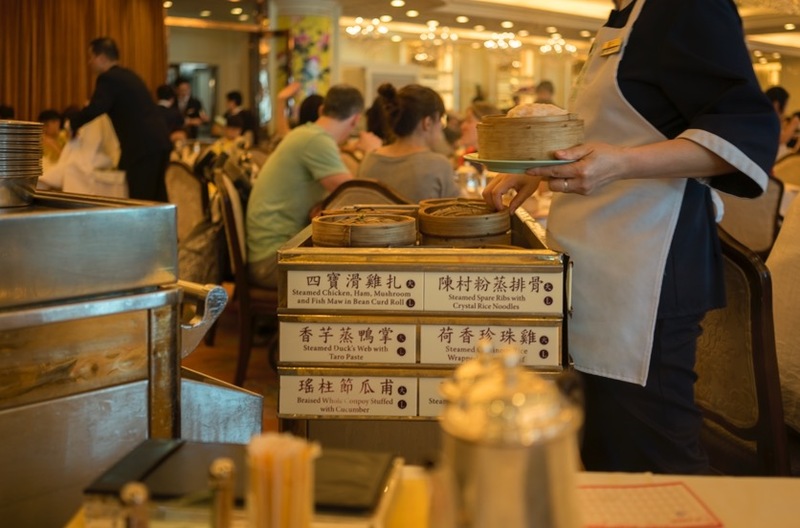 And of course, the second reason is that this is one of the very few places in Hong Kong, where the little delicacies are pushed around on trolleys and you can pick and choose what you like. Nowadays, most places make you order by ticking off items on a menu, but this old-fashioned way is much more interesting – a trolley turns up next to your table, the waitress shows you what she has on offer and you either nod or shake your head. Done. How easy is that? 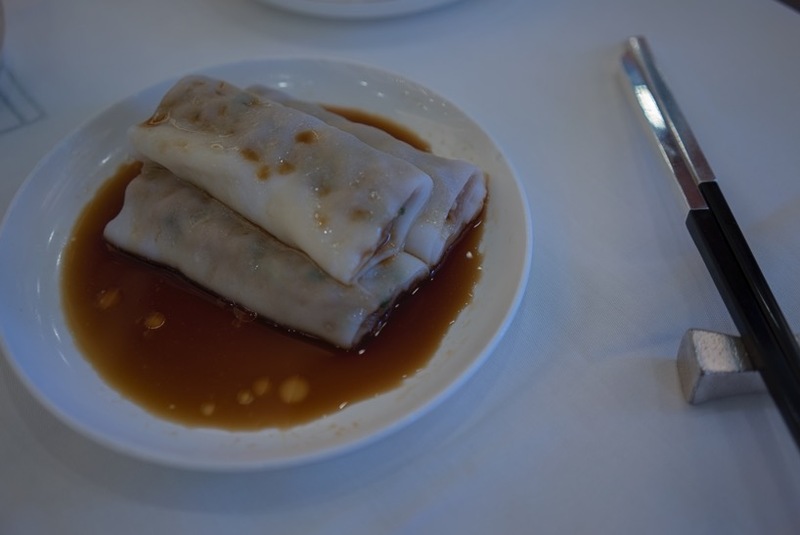 We enjoyed some dim sum classics, including the glutinous rice in the lotus leaf, bbq pork in rice paper roll and huge prawn in beancurd dumplings. Not pictured (we were too hungry) are the vegetable buns, the mango pudding and the custard bun we also devoured. Would I eat there again? Yes – but only if I don’t have to queue up (I’ve heard that you can end up queuing for quite some time, so go early or late). 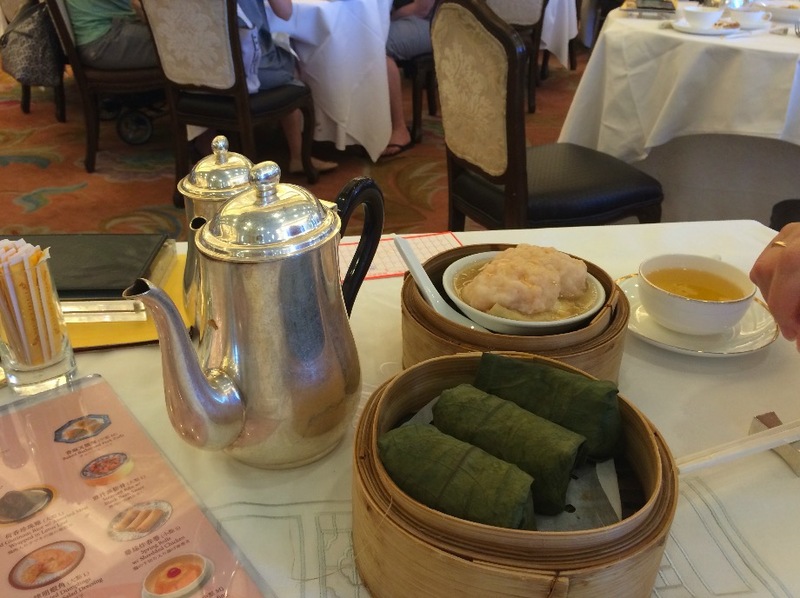 The dim sums taste really nice, portion sizes are big – but of course, you are in a prime spot, so the prices are higher than in other dim sum places (not that dim sum are expensive anyway, but I’m just saying). It is definitely something to try at least once, and maybe even twice or more if you don’t mind the noisy atmosphere and the potential queue. Dim sum connoiseurs prefer the “ticking list” method because they say the dim sum’s fresher at places using that method. There’s no denying that the old school cart method is fun though — and I think that seeing certain things on the cart would make me more inclined to try them than when readng a description of them on the list.